Wed, July 11, 2018 7:00 P.M.
Christopher "Quest" Rainey, and his wife, Christine'a "Ma Quest" raise a family while nurturing a community of hip hop artists in their basement home music studio. It's a safe space where all are welcome, but this creative sanctuary can't always shield them from the strife that grips their neighborhood. 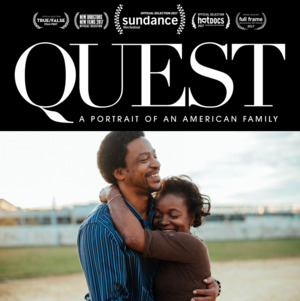 Epic in scope, QUEST is a vivid illumination of race and class in America, and a testament to love, healing and hope. The screening will be followed by a Q&A and a chance to meet principals of the film including members of the Rainey family and the filmmakers, Sabrina S. Gordon & Jonathan Olshefski . MONTGOMERY AUDITORIUM. Admission will be FREE & TICKETS are NOT REQUIRED. Seating will be first come, first served. Overflow seating will be in the Skyline Room where event will be simulcast.